The plans for the new facilities at Coolup are progressing well. We are lucky enough for our polocrosse fields to be within the first phase of the multi-million dollar up-grade of the Murray Equestrian Centre. 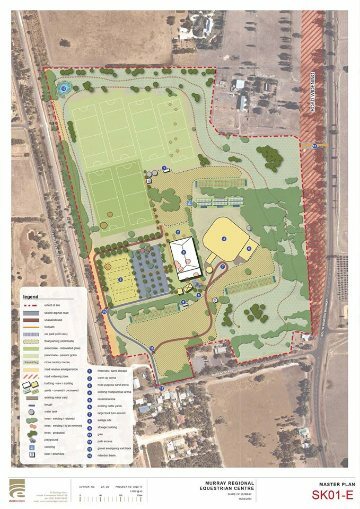 The plan (shown below) indicates the location of 6 new polocrosse fields at the North end of the grounds - 2 of these fields will be 'multi-use' fields shared with the other clubs within the Murray Equestrian Association (MEA), while the other 4 will be dedicated polocrosse fields. The dirt used to build up the fields combined with strategic drainage and irrigation plans will ensure that these new fields will be some of the best in WA! The new access road has been built and the earth works to create our polocrosse fields is already underway - we expect to be able to start seeding the fields in 2015 with them potentially being operational in 2016!! On December 5th 2014, the start of the earthworks were formally acknowledged by a “Turning of the Sod” ceremony at the grounds organised by the Shire of Murray. Many dignitaries were invited including Don Randall, Murray Cowper, Shire President Wally Barrett, CEO Dean Unsworth, Sport & Rec executive, Murray Shire town planners, engineers, our project organiser, Geof Whyte plus staff from the Murray Shire along with the Waroona Shire President and Alcoa. Well known personalities of the Coolup community, Coolup progress Association and some members from the MEA & PEA horse groups were also invited. It was a very fancy affair with live acoustic music in the background, a few speeches, the ceremonial digging of dirt and photo opportunities for the local papers which seemed to be enjoyed by all. Our club president, Gavin Brown, was thrown in the deep end, between members of parliament and the Murray CEO speeches and delivered a great speech on behalf of the MEA and the Murray Polocrosse Club. Several prominent members of the polocrosse community attended to show their support for the new development, namely Jodi Dunlop, Polocrosse World cup representative and Christopher Dunlop: Polocrosse State representative. Our very own Charli Brown, member of Murray Polocrosse club, also showcased the club by riding her horse at the ceremony. This ceremony marked the commencement of stage one of the facility upgrade and consists of the construction of four Polocrosse fields , two all purpose /polocrosse fields, a limestone car park, an ablution pad and a sewerage water treatment plant.